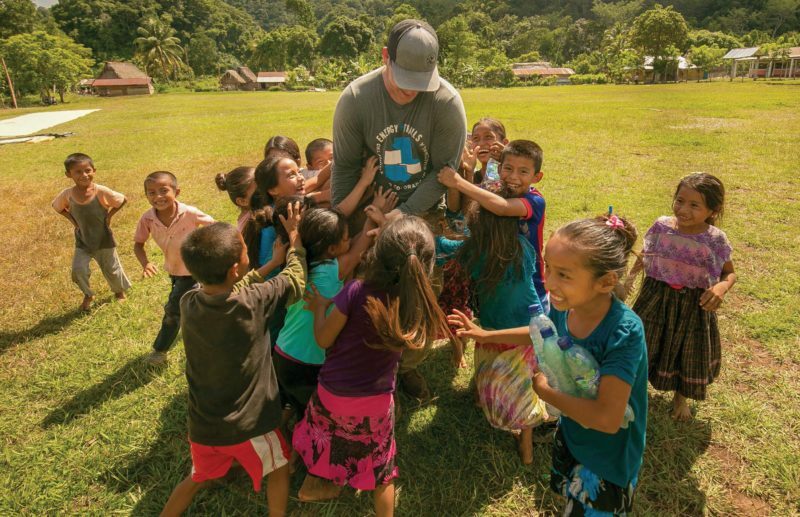 Children from a Guatemalan village playfully swarm a lineman from the Energy Trails Electrification Project in 2018. Photos by STUDIO1441. Eighty years ago, many rural areas in Oregon were in darkness, the citizens only brought out of a life of drudgery and hardship by determined electric cooperative leaders who planted poles and strung wire to places that some said would never have electricity. Today, few people remember when the lights first came on in their community and how a simple illuminated lightbulb meant a new way of life. In 2019, the U.S. electric grid is ubiquitous, making it harder to believe that an estimated 1.1 billion people—14 percent of the global population—still do not have access to electricity. Many more suffer from poor-quality supply. Oregon electric cooperative leaders are going back to their roots to help bring rural electrification to remote villages that are living life in darkness. Working with the National Rural Electric Cooperative Association International program, Oregon electric cooperatives are undertaking an ambitious plan to help electrify rural areas in Guatemala. NRECA International has worked in Guatemala for more than 27 years, providing ongoing support to develop a sustainable, reliable and affordable supply of electricity to many rural communities. NRECA International facilitates and manages volunteer participation from various U.S. electric co-ops. Volunteers are integrated into the NRECA International team when they travel to remote parts of the country. In addition to helping build, upgrade and extend power lines, these electric co-ops have invested more than $1 million for electrification projects in recent years to assist remote community energy systems. 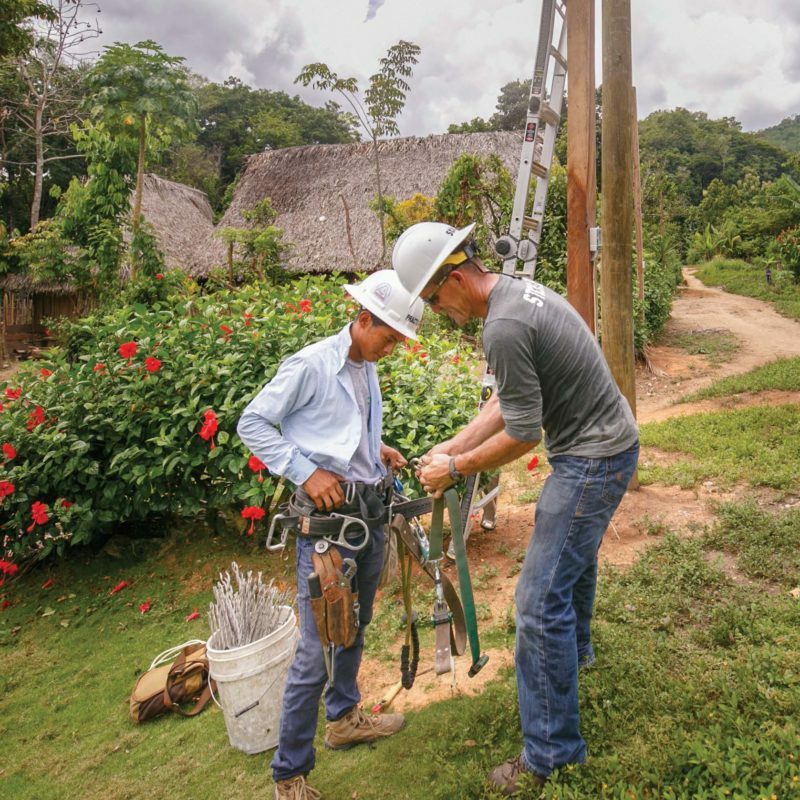 A lineman and local villager work on the Energy Trails Electrification Project in Guatemala. The project includes electric cooperatives from Oklahoma and Colorado. In the past several years, the focus has been placed on helping two municipalities—Ixcan and San Pedro—strengthen business practices and technical capacity of their utility operations. The goal is to help create a sustainable utility that can provide those communities with reliable electric service at reasonable prices. ORECA started exploring the Guatemala project in 2018, welcoming a series of speakers who have been involved in similar projects. One was Tom VanParis, former CEO of the Indiana Electric Cooperatives. That statewide has helped electrify several villages in Latin America. This led to a presentation at the ORECA annual meeting by Ingrid Hunsicker of NRECA International, who outlined the logistics of a state-sponsored project. Hunsicker did not downplay the obstacles for electrifying small, rural communities that otherwise would not receive help from local government or others, but she also mentioned the payoff. “This gives Oregon co-ops an opportunity to experience history and be present when the lights come on the first time for these small villages,” she said. In 2019, ORECA will work with NRECA International on a project profile and a planning trip to evaluate the area and determine the number of crews needed to complete the project. Oregon’s project leader is Roger Meader, who recently retired from Coos-Curry Electric Cooperative, which serves Oregon’s south coast. Meader is an engineer with extensive experience in the electric utility industry. Construction will start in 2020 and require 10 to 16 Oregon electric cooperative linemen. Depending on the project, they will be on the ground one to two weeks, often living and working in primitive conditions. In the meantime, ORECA and Oregon electric cooperatives will begin their preparations, raise funds and secure access to equipment that can be shipped to Guatemala. It’s a daunting proposition, but made less overwhelming when you consider that NRECA International has brought electricity to more than 160 million people in 44 developing countries. What happened in rural Oregon eight decades ago can happen in a faraway Latin America village. The flip of a switch can improve education, health care, safety and economic opportunity.